We have been on the market eight years already! and this when we finishedOur company has established high stock of flexible and reliable company. We associate over 30 craftsman’s from different branches: painters, varnishes, masons, paper – hangers, stuccoers – all of them are ready to assist you in implementing your most difficult ideas. We always provide you with high quality and on time service. 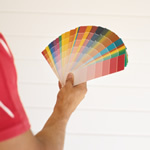 Your house needs new paint brighten the facade? Then you're in the right place! To use high-quality facade painting exterior paints of renowned manufacturers. Pattern book is so broad that it chooses to everybody. You find your color in our pattern book. Use our calculation for orientation in costs for your order.